Casa Chica is a pretty house on the edge of the ancient and sleepy hamlet of Bayacas, a 10 minute drive, or 25 minute walk along the Rio Chico from Orgiva. The Rio Chico runs through the village from the snow-capped high Sierra Nevada towards Orgiva, a bustling market town. On a clear day you can see the Mediterranean in the distance. 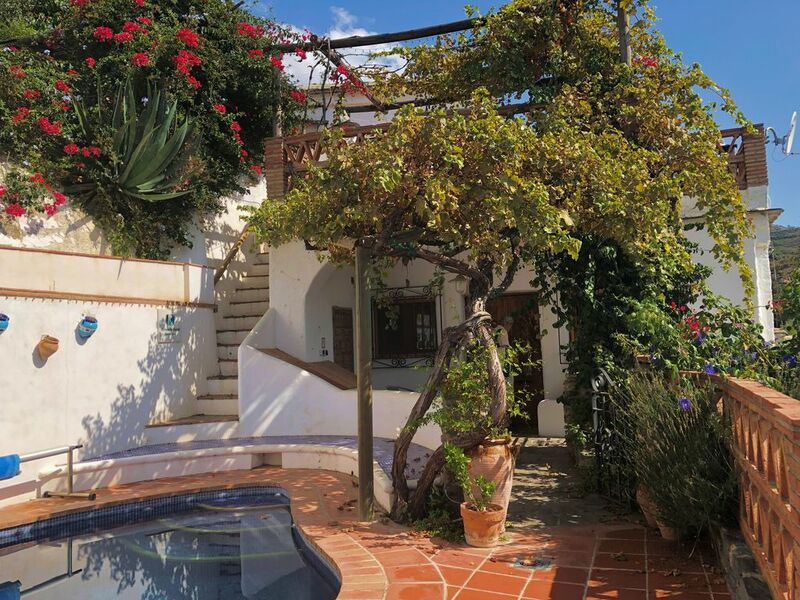 The house is beautifully renovated in the traditional Moorish style with original chestnut beams, alcoves, hand-made tiles and fireplace and is well equipped with all modern equipment. There is a large roof terrace, and 2 other terraces, and swimming pool (4.5m x 3.6m) all facing south or south-east, where you can enjoy the stunning views, listen to the goat herd passing and village life. In the village is one of the oldest churches in Las Alpujarras and also riding stables. There is a strenuous walk up past some ruins to Carataunas where there is a bar/restaurant. There is some lovely walks in all directions, through olives, avocado, almond, orange and lemon groves. Sal and Andy live in and run a Healing Retreat Centre in the Heart of the Cotswolds but we have another house, because we have a passion for restoring ruins in beautiful places! We have 6 children who are all grown up and doing interesting things, and Andy is trying to sell his water purifying business in Hitchin (a long way from home). We have lived in the area for about 39 years and our 7 grandchildren live up the road and 3 in Brighton. We spend our time running our businesses and seeing our family and visiting our house in Spain to 'get away from it all', but whatever 'it' is seems to come with us! Andy loves tinkering with his old cars and mowers and actually mowing on some ancient machine and Sal loves singing and dancing and a million other things. We fell in love with this village because it feels as if it is still in the last century (or two) and yet it is walking distance to the market town of Orgiva with lots of vibrant bars and restaurants and alternative shops. We first read about the region in Driving over lemons by Chris Stewart, with his hilarious tales of buying a derelict house close by, and his dealings with his neighbours, and we wanted to experience this beautiful and historic place before it changed irrevocably with tourism and commerce. The area is still traditionally farmed and our neighbour still uses mules. The architecture is original Moorish It is utterly unspoilt and quiet with the tinkling sound of goat bells as they are driven through the valley. We first came to the area as we were attracted to Cortijo Romero, an Alternative Retreat Centre near Orgiva. We came back many times and eventually the spell of the whole area bewitched us. We have the best of all worlds in that it is in the beautiful foothills of the Sierra Nevada- Las Alpujarras - with ancient mule tracks between the old pueblos blancos (Moorish white villages) and in a few miles of hairpin bends you are in the very high Sierras and can walk to Mulhacen, the highest peak of over 4,800 metres The village is full of almond lemon and orange trees, avocados and vines, and colourful Mediterranean plants. It only takes 35 minutes to drive to the Costa Tropical with lovely fish restaurants and warm Mediterranean sea. Then there is the amazing cultural city of Granada and the Alhambra Palace less than an hour away where you can stroll through the old Arab quarter. And for us, the added benefit of being able to get to the Ski resort in an hour and half. With the new motorway it takes an hour and a half from Malaga Airport, and we often stay the night there when we arrive at the airport, and enjoy downtown Malage, and the beaches on the way to the house. So really we have everything we possible need at our fingeretips. toilet, shower, This is an ensuite to "The pool room bedroom"
En suite shower room plus wc to bedroom 1 and en suite shower room plus wc to bed 2, plus separate bathroom, bidet and wc. Parking is in the village square near the church. It is 100 metres from the house. Open plan kitchen-sitting-dining room in distinct areas with double sofabed, radio, CD, wood burning stove, door onto terrace. Dining area sits 4-8 and 2 seats can be extra single 2m beds. Double French doors open onto small terrace/large balcony. Electric cooker, large gas hob, large fridge with freezer compartment, dishwasher and central heating. Lots of books both in the sitting room and downstairs bedroom ranging from books about Spain, to novels and biographies. The balcony leading from the dining area overlooks the tiny street below where typical Spanish life goes on with the locals. It has a tabel and chairs for al fresco dining. The veranda leads from the front door to the pool area and is separated by a low wall and cast iron gate to make it safe for toddlers. There is tiled seating by the pool. Three terraces - two partly shaded by a vine and one on a balcony. The roof terrace has beautiful views of the mountains and village and a glimpse of the sea on a clear day. To get to the house you have to walk up some stairs, therefore we do not recommend coming if you have difficulties walking. Notes on accommodation: The second bedroom is directly below the sitting rooms but down steep stairs outside and we do not think it will be suitable for the very old, the very young and the very drunk! We have a travel cot and high chair. The main patio is closed off from all stairs by gates to make it safe for toddlers. Outside: Our roof terrace is large and looks out over 3 directions but is sheltered by a higher property to the north. The vine terrace outside the front door is dappled sunlight and faces south with small swimming pool. (4.5m x 3.6m, heated by solar panels) The pool is only accessible through a gate so that toddlers are safe. The small terrace/balcony that leads from bedroom 1 and the dining area faces south east. We have 2 sun-loungers and a dining table and chairs on the roof. The table and chairs on the lower terrace are interchangeable and modular with the ones in the house. Storage area (and water tank housing) for garden chairs on roof terrace. Utility Room: Washing machine, boiler and gas bottles. Cleaning / Towels / Linen / Maid service: Linen and towels provided but not beach towels. The house will be cleaned before your arrival. We enjoyed our stay in this lovely hideaway in the mountains and despite the twisty hairpin drives and cold rainy weather, we will not hesitate to book another stay should we return to area again. We had a wonderful holiday. All the facilities were good and the accommodation worked really well for us. The pool is blessing at the end of a hard day walking or sightseeing. We visited Granada, Ronda, Malaga, Orgiva, Salobrena and Marbella. Went to several beaches and walked around the local area and having the odd lazy day at the house. Casa Chica - La Casa Bonita. We stayed for ten days in June 2017. All four adults enjoyed our stay immensely. Not only the panoramic views, collage of sweet scented flowers but the orchestral accompaniment of birdsong. Casa Chica is tastefully built and decorated in true Spanish rural style. It is a haven from the pressures of life to sit on the rooftop terrace or by the pool and relax in sunshine. Casa Chica is truly La Casa Bonita. V.Forde, Dublin, Ireland. A wonderful place to relax and unwind. A perfect place to relax and unwind. The house is beautiful, very comfortable and is fitted out in a lovely Moorish style. Such a wonderful retreat it was so hard to tear ourselves away. Nothing to do all day other than enjoy the views, relax on one of several terraces, dip in the pool and listen to the bird song or occasional the sound of the goat herd passing through. Good location also is you wish to be more active and visit the lovely white towns and villages of the Alpujarras. We definitely hope to return. A real gem. Thanks so much for your lovely review, we can't wait to get out there ourselves, it's one of our favourite places. Do come back! We've just arrived back from a week's stay. We had a wonderful time. The house was lovely, spacious (we were five), very welcoming, nicely kept and clean for our arrival. I liked that there are a lot of bathrooms/toilets. The views are gorgeous and I really liked Orgiva, the nearest town. There was more going on there than I had thought. Thanks to Sally for giving us the opportunity to stay in her house and thanks to Yves and Janet next door for helping us out with a few bits and bobs. I highly recommend this rental property. 60 minutes drive to La Herradura (lots of great chiringuitas). 1 hr 10 to Nerja - white sand, picturesque bay (English tourists). In between Salobrena and Nerja are National Park beaches which you have to walk down to, no facilities, lovely coves. Driving east go to Castell del Ferro or just before Playa Rijana. Car hire essential (we can recommend companies for Malaga and Granada). Orgiva (nearest market town) 5km, 10 mins drive, 25 mins walk, 3km. Almeria and Spaghetti Western film sets between 1 -1.5 hours. Pampaneiro/Bubion and Capilleira (pueblos blancos) 20-30 mins drive. Trevelez (highest inhabited village in Europe) 50 mins drive. Costa Tropical (less developed than Costa del Sol) 45km, 35 mins. Seville 3 hours we can advise on secluded coves in National Park. Riding stable in Bayacas. Yoga in Orgiva (walkable). Skiing is 1 hour 35 mins at the excellent resort of Pradoliano (Solynieve) in the Sierra Nevada. You can hire skis boots and lift pass for a day. Fantastic walks along ancient mule tracks to medieval villages. The village has a weekly tapas party on Friday nights at the 'plaza' where everyone is welcome and on winter evenings they have a brazier burning logs, a bar and tapas, a creperie, and live music. We can send you more detailed info about the area, restaurants (including fantastic vegetarian). There are good supermarkets in Orgiva, lots of excellent restaurants and banks.